This was such a busy decade that I will not attempt to detail allthe litters bred as I tried various combinations of the bloodlines that had formedour foundations in the sixties.. Instead, I will concentrate on those that have had the greatest influence on subsequent generations of Brambledales and especially the individuals whose names still appear in Brambledale pedigrees of the new millennium. The sub-page 'Extras' features some interesting 70s Brambledales who could not be fitted into the main page. Briar Rose was five years old before the birth of her first litter, having had to wait for young Balthazar to grow up, but the resulting puppies were well worth the wait. 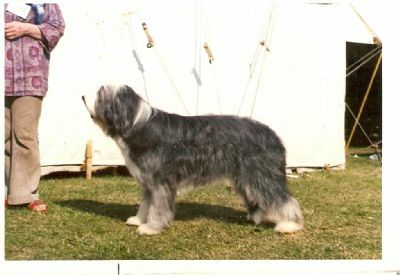 She and Balthazar produced a total of 21 puppies in three litterswhich included many top winners and foundation stock for other breeders around the world. 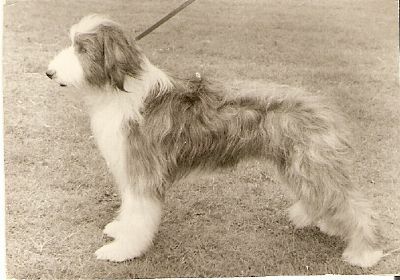 Ch.Brambledale Bathsheba at about 18months old. Brambledale Black Rose, born1971 by Ch.B.Balthazar x B.Briar Rose. 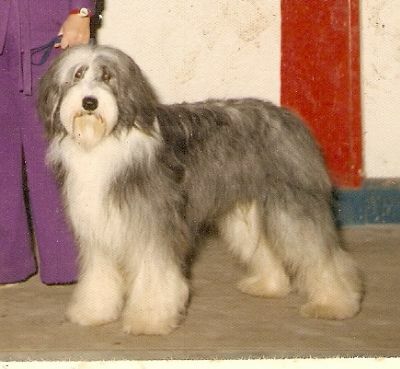 Black Rose, known as Fanny, had a litter by B.Boz before joining her litter brother, B.Benedict, at Moira Morrison's Cauldbrae Beardies in the USA. Of all the pictures of my 'babies abroad', sent to me by their new owners,this one ( from Doux's owner, Lena Pispala) is my favourite.If 'a picture speaks a thousand words' this one says it all! 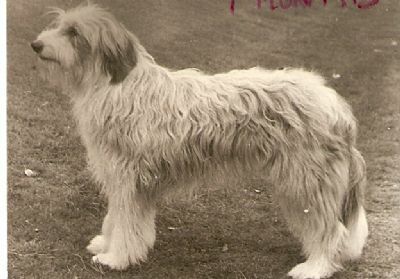 But perhaps the best known of the Balthazar x Briar Rose progeny was Brambledale Blue Bonnet, from the 1972 litter, who became the breed's first American Champion and first Best in Show winner at an all-breeds show. 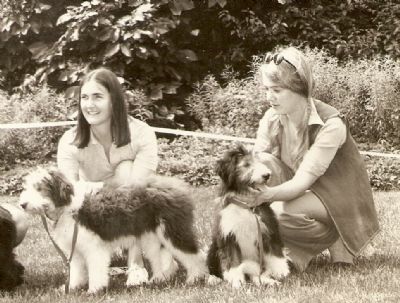 Am.Ch.Brambledale Blue Bonnet (left,with Henrietta Lachman),soon after arriving in the USA. 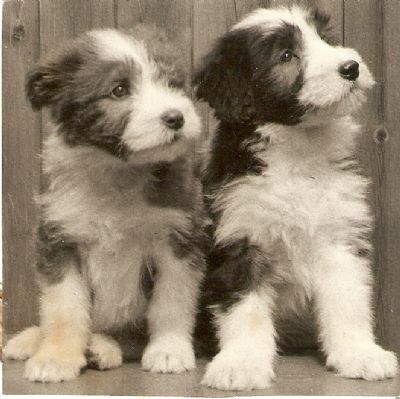 On the right (with me) is her litter sister, Brambledale Beth- more typically Brambledale than Bonnet, whose flashier markings and heavier coat appealed to the American judges. 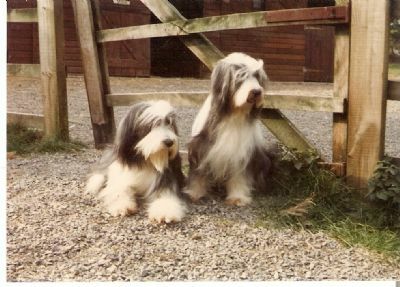 B. Barberry also produced a litter in 1972, from a mating with Suzanne Moorhouse's Braelyn Broadholme Crofter. From this litter I kept a dog puppy, B.Boz. 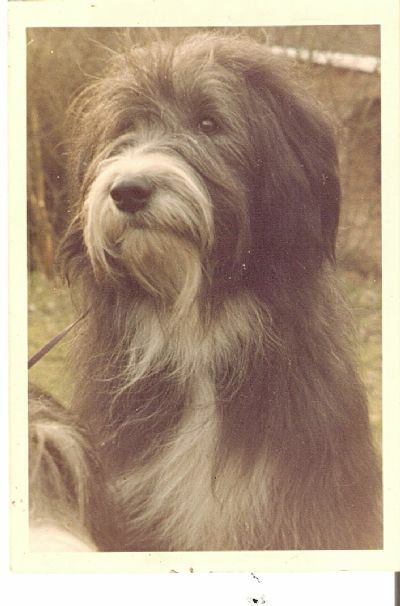 Above : BrambledaleBoz at 9 months in 1973 .A black puppy who suddenly turned silver at about 7months,Boz later darkened to a medium slate. Known to his friends as David (named after my brother, also something of a clown), Boz was a great character who enjoyed everything he did-especially when he had an audience to watch him do it! 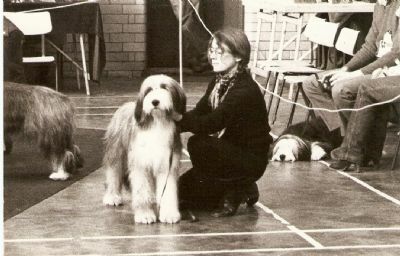 Even in the show ring he loved to play to the crowd and his aim was always to make them laugh. This didn't stop him winning, though, and he was one of the first Beardies to gain a Junior Warrant and also won a Res.C.C. 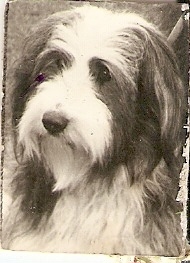 at an early age before going to Canada to help Barbara Blake to build up her Colbara kennel. 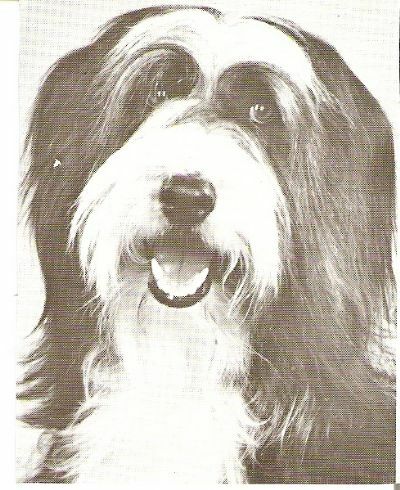 Boz wasvery popular in his adopted country, both as a character and as a stud dog. I had only agreed to part with him on condition that he would live as a member of the Blake family and not in a kennel and this he did for the rest of his long and happy life. 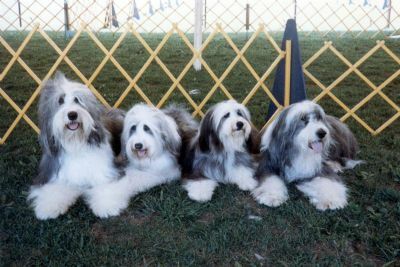 14year-oldBoz (far right) still enjoying a show. With him here are a son, daughter and granddaughter : just some of his Canadian progeny. One of my great favourites, Bluebell combined the charm of both her parents, withDavid's larger-than-life personality moderated by the gentleness and natural good manners of Dorcas.And, like her mother, Bluebellproduced some outstanding puppies by Balthazar, including my own B.Balzac,B.Blue Jay and B.Boreas. The two pictures above, of Blue Jay and Balzac, remind me of something I would rather forget.........that I did occasionally sacrifice my principle of natural showing and adopt the "prayer meeting" style that had become de rigueur !All I can say in my defence is that at least my distaste shows on my face! 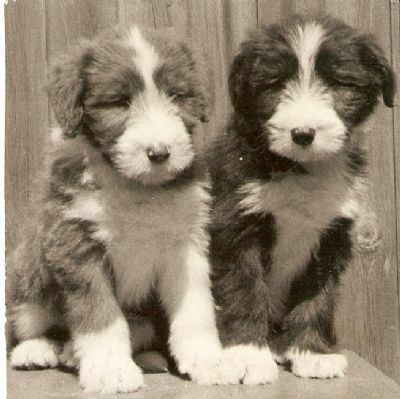 It is not surprising that these two looked like brother and sister-although Bathsheba was 6years older than Balzac, they were both by Balthazar and their mothers, Briar Rose and Bluebell, were themselves mother and daughter. Barberry's influence wasnot only through her son, Boz, however. 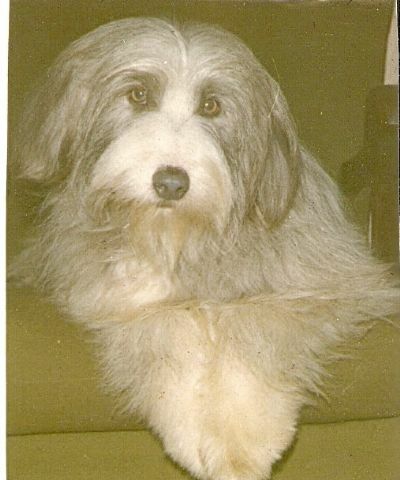 In 1974 she was mated to her litter brother, Balthazar and produced a lovely litter, including another of my particular favourites, B.Benedicite, known as Grace. Brambledale Benedicite (Grace) born 1974 by Ch.B.Balthazar x B.Barberry. Grace was everything I wanted in a Beardie. Her charactercombined great intelligence and eagerness to learn with a confidence and responsiveness that made her entirely reliable in any situation and her conformation, coat and hauntingly beautiful expression were outstanding. 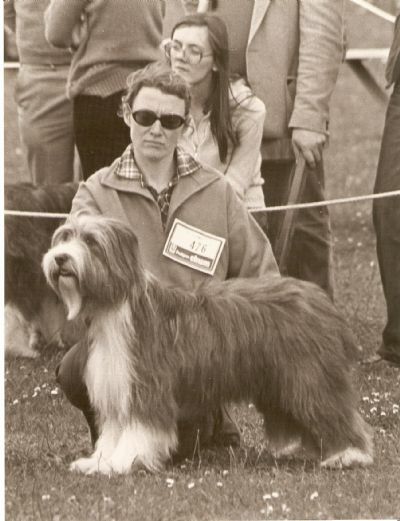 I thought then-and still think-that she epitomised the Breed Standard. But even in the mid-seventies, showring success required more coat and more glamour than I liked .....so my lovely Grace stayed at home while I showed her half-sister, Bathsheba, with great success. But if Bathsheba was queen of the showring it was Grace who reigned at home as the materfamilias who ruled for longer than any of her predecessors or successors. And it is Grace, rather than Bathsheba, whose influence remains in the modern Brambledales. The Seventies had been exciting, frantically busy and largely successful but the decade ended sadly with three notable deaths.In August 1979 we said goodbye to the irreplaceable Brett (Ch.Heathermead Handsome) who had started it all back in 1962. 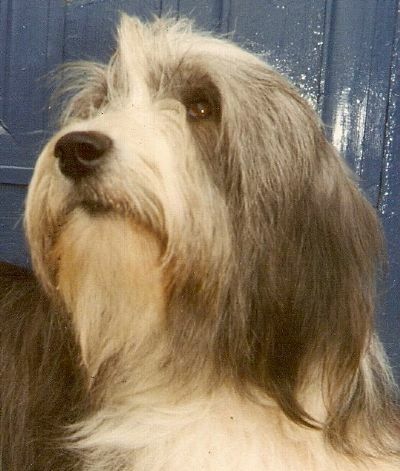 At seventeen and a half years old he had lived a long and happy life and left us many happy memories.The sudden death of his eldest daughter,Briar Rose, just a month later, at thirteen and a half years, was harder to bear. But worse was to follow and the loss of ten-year-old Angel (Ch.B.Balthazar ) at Christmas 1979,came as a terrible shock, leaving us numb with grief .